The winner(s) of the DockerCon Cool Hack Challenge will receive a free ticket to DockerCon 2016, flight to Seattle and hotel accommodations. Up to two teams will be accepted, maximum 2 members per team. You can read more on the blog. If you're working on something cool then send it in! Docker runs very well on all three generations of the Raspberry PI (Zero/A/B/B+), Model 2 and Model 3. 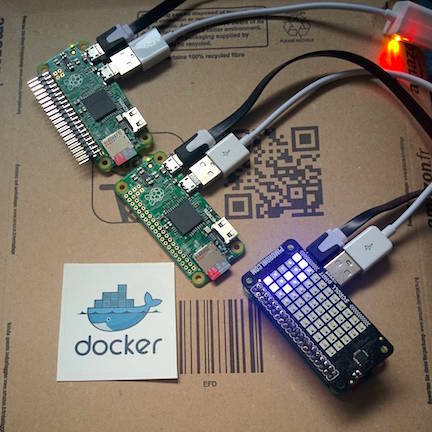 Docker's Native clustering solution (Swarm) works almost out of the box with the Raspberry PI. Raspberry PIs are both cheap and widely available - great for simulating real clusters. My hack builds a network cluster from four Raspberry PI Zeros costing just 5USD each and three 8-Segment LED boards. It brings together the IoT functionality of the Raspberry PI and the power and ease of Docker's native clustering capabilities. One PI Zero is designated as a manager and the other three are workers which light up when a web request is passed onto them. Earlier in the year I wrote a magazine tutorial for Linux User & Developer showing that Raspberry PIs could scale a web application across multiple devices using Docker Swarm. So I was already half-way towards achieving my hack. Next I had to prove that Docker could access the GPIO pins of the PI, this was simply a case of building out an image with the relevant Python libraries and system permissions. Once I had turned an LED on and off a few times I moved on to add-on boards such as the Pimoroni scroll-phat. I raised a Pull Request to have my Dockerfile merged so that anyone can use the board through Docker in the future. I eventually settled on the Ciseco Pi-Liter for its low price of £3.00 and compact form. I didn't want any cables to be trailing off the PI's headers. This kit would have to travel well. We have 4x Raspberry PI Zeros. The first PI is designated as the Swarm Manager and the other boards are Swarm Agents. Each Agent has its own Pi-Liter LED board connected to the 40-pin GPIO header. Three Python Flask containers (iotnode) are started on the swarm and automatically placed on each one of the PIs. These are responsible for turning LEDs on and off. Nginx (a common load-balancer) is started on the Manager and queries the Swarm Remote API to get a list of (iotnode) containers and builds up an nginx.conf file of upstream servers. This this point curl or apache-bench is used to make a number of requests to the Nginx load balancer on the Manager. Nginx will distribute the requests across the PI Zeros. Each PI Zero lights up waits 0.1 seconds then turns the LEDs off again using a simple Python script. In the video I give a quick explanation of the setup then use curl and Apache Bench ab to simulate a real-world load on the cluster. My video was re-tweeted by Solomon Hykes: the creator of the Docker Project and I got this, too. I will be getting a framed copy! What would you build with Docker and the Raspberry PI? What sensors, lights or add-on boards make sense to you in a cluster? Let me know in the comments or on Twitter @alexellisuk.